This annual event takes runners on a scenic tour of Rome, passing some of the most famous monuments in the city like the Colosseum and St Peter's Basilica. Although it may be a tiring way to tour the city, it is an exhilarating race, extremely well-supported, and enjoys a festive atmosphere. The Marathon Village sets up about a week in advance with concerts, stalls, and shows, as well as all the practical race necessities. In fact, during the races, the event turns the city into a stage with more than 50 music acts including international stars, rock bands, DJs, folk groups, and local talent performing along the route to encourage the runners and entertain the crowds of spectators. 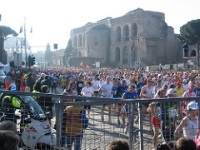 Although the full marathon is a serious competitive event which attracts talented runners from all over the world, there is also the Roma Fun Run, which is non-competitive and attracts about 80,000 people annually. Participants in this event are free to do as they please and some bring along their dogs or rollerblades.